მარაიკე ვენცელი არის მსახიობი და პერფორმანსის ხელოვანი ბერლინიდან. ბირმინგემის სამსახიობო სკოლაში მან დაამთავრა სამსახიობო ფაკულტეტი. ბოლო 6 წლის განმავლობაში ის მოღვაწეობს პერფორმანსულ ჯგუფში - SIGNA, რომელიც მიწვეული იყო სხვადასხვა ფესტივალებზე, როგორებიცაა: Berliner Theatertreffen, Schauspiel Köln, Salzburger Festspiele, Volksbühne Berlin და სხვა. 2012 წლიდან ის, ასევე, თანამშრომლობს ქალთა უფლებების დამცველ ორგანიზაციასთან - TERRE DES FEMMES, რომლის ფარგლებშიც მან გერმანიის მასშტაბით განახორციელა პერფორმანსი ქალთა ტრეფიკინგის წინააღმდეგ. 2011 წელს მან შექმნა ინტერდისციპლინარული პერფორმანსული პროექტი Salon Tbilisi Berlin, რომელიც არის ქალ მწერალთა გაცვლითი პროექტი საქართველოსა და გერმანიას შორის. Salon Tbilisi Berlin ხორციელდება წელიწადში ორჯერ, თბილისსა და ბერლინში. პროექტის ფორმატი არის ტრადიციული ქართული სუფრა თამადით. პროექტის ფარგლებში 5-7 ქალი ბერლინიდან და თბილისიდან ითავსებენ თამადის როლს და წერენ ტექსტებს ქართული სადღეგრძელოების თემაზე. ქართული ტექსტები გერმანულ, ხოლო გერმანული ტექსტები ქართულ ენაზე ითარგმნება და პროექტის ფარგლებში გამართულ სუფრაზე ხდება მათი წარდგენა. ამ პერფორმანსების დროს მწერალთა მიერ მზადდება ქართული და გერმანული საკვები. დამსწრე საზოგადოებას შეუძლია მიირთვას მათთან ერთად და ამავდროულად, მოუსმინოს ტექსტებს და აქტიურად ჩაერთოს პროექტში. ყოველი პერფორმანსის განმავლობაში, დამსწრეთა ისტორიებიც გროვდება, რაც საბოლოო პერფორმანსის ნაწილი გახდება. საბოლოო პერფორმანსი ჩატარდება 2014 წლის ზაფხულში. ყოველი მონაწილე მწერალი შეიკრიბება, გადახედავენ ერთმანეთის ნამუშევრებს, შეარჩევენ ტექსტებს და შექმნიან ინტერაქციულ პერფორმანსს, რომელიც ჩატარდება ორივე ქალაქში. ასევე, დაგეგმილია პროექტის ამსახველი პუბლიკაციის გაკეთება, რომელშიც გამოყენებული იქნება ფოტოგრაფ იან ვილკენის ფოტო მასალა. Mareike Wenzel is an actress and performance artist from Berlin/Germany. She graduated from Birmingham School of Acting with a BA(hons) in acting. For the past six years she has been working as an actress for the performance company SIGNA. Their performances have been invited to Berliner Theatertreffen, Schauspiel Köln, Salzburger Festspiele, Volksbühne Berlin and others. Since 2012, she has also been collaborating with the women's rights organisation TERRE DES FEMMES for which she devised a performance against trafficking of women which toured throughout Germany. In 2011, she founded the interdisciplinary performance project Salon Tbilisi Berlin, which is an exchange project between female writers from Georgia and Germany. The Salon Tbilisi Berlin takes place twice a year in Tbilisi and Berlin. The frame for the project is the Georgian tradition of the supra - traditional Georgian feast/banquette with the tamada - toastmaster. In Salon Tbilisi Berlin five to seven women from Berlin and Tbilisi are taking over the part of the tamada and are writing texts on the topics of the Georgian toasts. These texts are then translated into the other language and presented during a supra in Tbilisi and Berlin. 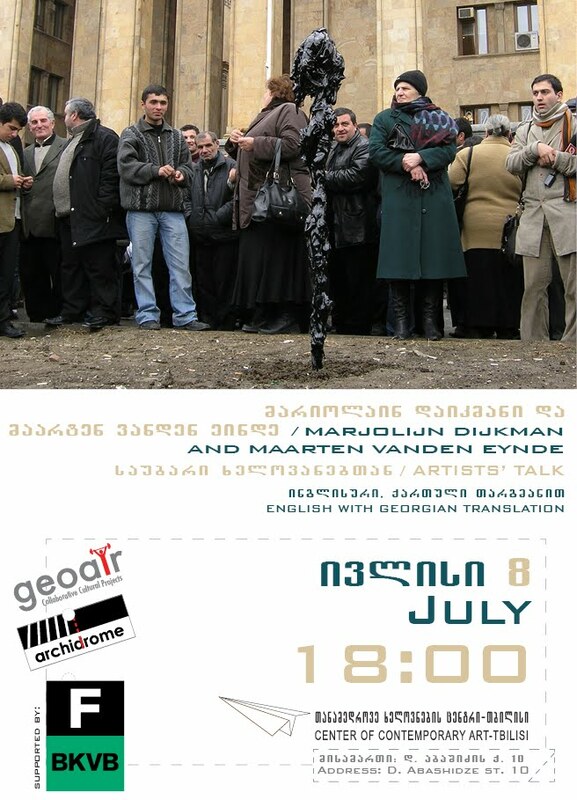 During these performances there is German and Georgian food cooked by the writers and the audience is invited to sit and eat together with them, as well as to listen the texts and also actively take part. During all performances the stories of the audience are also collected and will be included in the final performance. The final performance will take place in summer 2014. All participating writers will come together, review their work, select texts and based on all collected material device an interactive performance which is then going to be presented in both cities. A publication documenting the project, including photos taken by photographer Jann Wilken is also planned.